Beethoven’s first published works—his Opus No.1—were three trios for piano, violin and cello and already they show a marked advance on Haydn’s trios in the comparative interdependence of the three parts. Their freedom from Haydn’s oppressive formality looks forward to the first mature trios, the pair that comprises Opus 70, displaying all sorts of harmonic twists, thematic innovations and structural idiosyncrasies, these trios make much of the piano part and contain plenty of dramatic outbursts that are typical of Beethoven’s middle period. Even more arresting is the first of the Opus 70 trios (1808) nicknamed ”The Ghost” because of its mysterious and haunting Largo. Its sibling boasts a cheerful bombastic finale that is the most entertaining music that Beethoven composed for this combination of instruments. 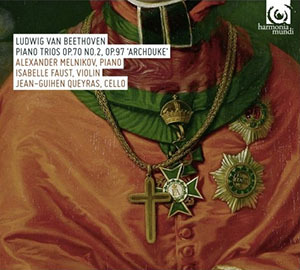 The “Archduke” Trio Opus 97 (1811) was Beethoven’s last full – scale work for piano trio and is typically conclusive. The third movement is its centre of gravity, a highly moving set of variations with the cello dominating the thematic content. It opens with a hymn-like theme and progresses to a coda which magnificently sums up the movements ideas. The finale might be less powerful than that of Opus 70 No. 2, but it nevertheless has a sweeping rhythmic power. Again, it is beyond the shadow of a doubt that Beethoven defined the piano trio form that it retained throughout the 19th century by allowing the string instruments the status of genuinely equal partners in this superlative performance. 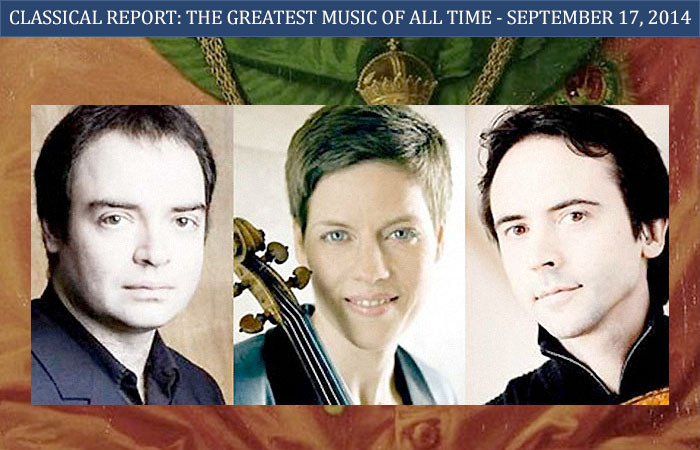 This is clear from the performances of pianist Alexander Melnikov, violinist Isabelle Faust and cellist Jean-Guihen Queyras present Beethoven’s last two works in the genre—Opus 70, No. 2, dedicated to Countess Marie Erdödy and the celebrated ”Archduke” that also marked the final public appearance of its composer. Ms. Faust and Mr. Queyras as well as Mr. Melnikov reach into the depths of their individual and collective souls to find the spectacular tone textures that Beethoven had intended. They bring these forth with breathtaking motifs and heart-stopping melismas once again showing that interpretation requires genius enough to inhabit the skin of the composer in order to find the right balance between a perfect reading of the score and emotion that is over and beyond that the text might even suggest despite specific diacritical remarks by the composer. 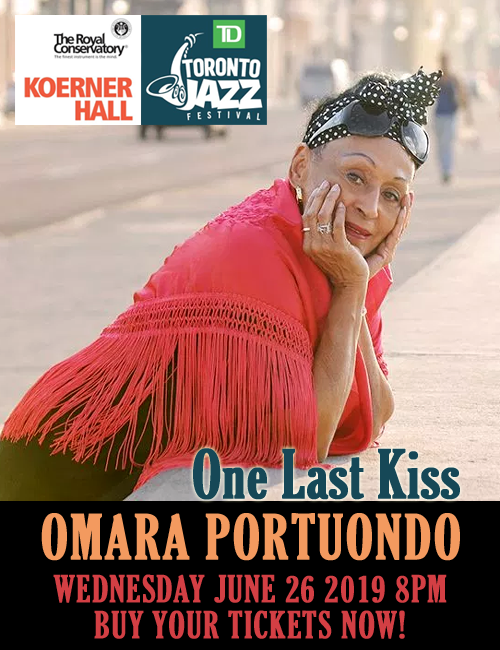 This is a wonderful recording indeed.